Wishing you all a very Happy Easter Monday. 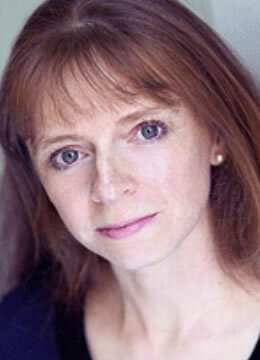 Today’s post has been written by harpsichordist, pianist, teacher, and writer Katharine May. Katharine (pictured below) teaches the instrument and gives regular concerts, both as a soloist and chamber musician. Over to Katharine. 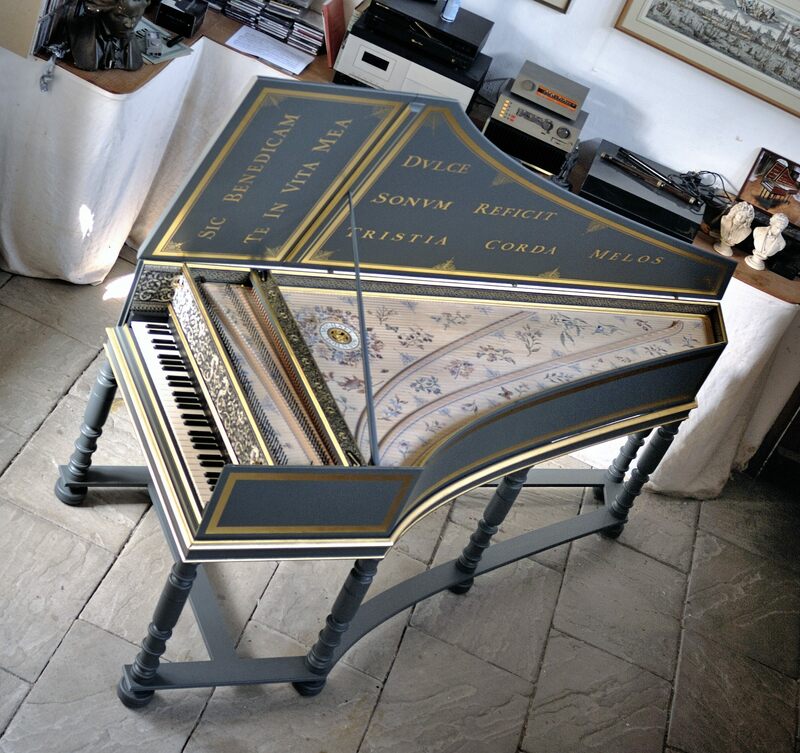 I am delighted to be writing for Melanie`s blog, and sharing with you my love and enthusiasm for the harpsichord, which I`ve been playing for most of my life so far. Here is a brief introduction. The harpsichord belongs to the family of plucked keyboard instruments which also includes the spinet, muselar and the virginals. All strings are plucked by quills in a simple yet effective mechanism: at the end of each key is a slim piece of wood or jack about 15 cm long. At the top of the jack in a separate, hinged piece of wood called the tongue, protrudes a short quill which sits underneath the string, plucking the string when the key is depressed. A square piece of felt set into the jack next to the quill acts as a damper, while the moveable tongue prevents the quill striking the string again as it passes back under the string to its resting position when the key is released. Quills were originally made from crow`s feathers, though makers today often prefer to use a form of plastic called delrin which is more durable. 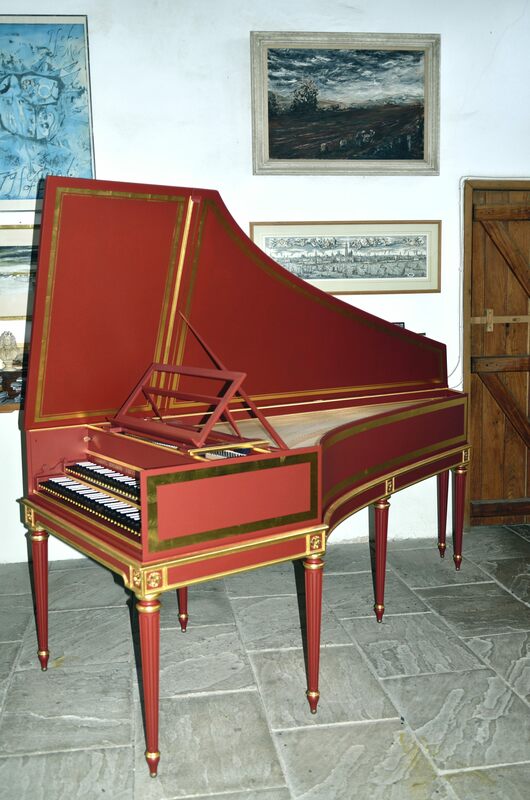 A typical harpsichord may have two or three sets of strings to each note – two 8 foot strings sounding at normal pitch, and a 4 foot set sounding an octave higher. The compass of a harpsichord can range from about 4 to 5 octaves with composers often making use of all the notes including the lowest and highest. The earliest known harpsichord dates from c1430 and is an upright instrument or clavicytherium belonging to the Museum of Instruments at the Royal College of Music in London. Developed over the following generations, it was a popular instrument in the home from roughly the mid 16th century to the mid/late 18th century, and comes in various shapes and sizes. Italian instruments for example use the wood from the nations` cypress trees which helps to produce a particularly strong yet dry and incisive sound, and is ideal for continuo playing. German instruments are more robust in construction and sound with great clarity of tone, perfect for complex fugues. French instruments are invariably smooth, sweet toned, and also resonant making them ideal for harmonically rich and often highly ornamented music. Smaller instruments will usually have just one keyboard or manual, while larger ones might have 2 or even 3 manuals, all designed to provide additional tonal options. Other members of the plucking keyboard family work on the same principle but are just shaped differently and more importantly, their strings` plucking point is different which changes the instrument`s timbre and tone. Despite Thomas Beecham`s infamous though derogatory description of a harpsichord, the instrument is in the right hands, capable of incredible expression. Completed in 2013 by Michael Johnson. To bring out the very best of an instrument, and using basically a finger technique, a harpsichordist will need to develop a variety of different touches from highly legato to staccatissimo. Players will need to learn to make the instrument sing using a sensitive cantabile touch (Bach`s Inventions and Sinfonias were written with just this purpose in mind), and be aware of it`s rhetorical powers, learning to shape phrases through the subtle art of timing, and occasionally staggering the pluck in each hand for heightened expression, as well as over-holding some notes to increase sonority and tonal depth. Additionally, they need to know and understand all the historical performance practice issues; how to interpret music which has scarcely any instructions from the composers. Around 300 years of repertoire exists for players to explore, as well as an ever-widening range of contemporary pieces. This includes music from the Elizabethan virginalists, to Purcell and his contemporaries, the early German composers such as Böhm, Buxtehude and Fischer, J.S. Bach of course and his other family members, and a whole plethora of French composers starting with Chambonnières, Louis and François Couperin, then moving to Rameau and the late French composers such as Balbastre and Duphly. Italian composers range from Frescobaldi through to Domenico Scarlatti. Some classical repertoire, such as the early sonatas of Mozart and Haydn were also written with the harpsichord in mind. A harpsichordist will be expected to be able to accompany other musicians, often from just a figured (and sometimes unfigured!) 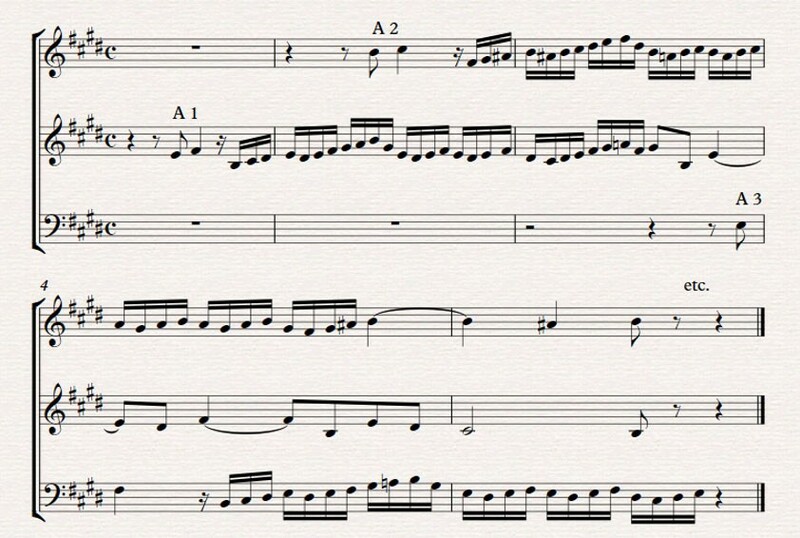 bass line. This could be anything from a solo instrumentalist or singer, to chamber groups, orchestral music, oratorios and cantatas, and operas. Completed in 2009 by Michael Johnson. As a harpsichordist, I am often expected to transport my own instrument to concerts. So, a suitable car is necessary (a Ford focus estate is perfect), as is the ability to tune it, usually to a specified temperament. Baroque composers were generally conservative in their choice of keys so Baroque temperaments favour common 5ths and 3rds which can make a huge difference on the effect of the music. A brief modulation to a more remote key can result in some quite pungent tunings, heightening the music`s emotional impact, something which composers (and performers) would relish. As a harpsichord is made entirely of wood, they are sensitive to changes in temperature and humidity. On a typical concert day, I might have to tune my harpsichord up to 4 times; before and during the rehearsal, before the concert and during the interval. I am also usually the first to arrive and the last to leave. Today, players will usually have a modern copy of an antique instrument. Original instruments are not only extremely valuable (depending on their condition), but also need more specialist upkeep and are less suited to constant travelling. There are many excellent builders living in the UK and abroad who copy the originals very precisely in order to be as faithful to the original sound as possible. Additionally, modern copies commonly have a transposing mechanism making them playable at A= Hz 415 (baroque pitch) or A=Hz 440 (modern pitch). Antique instruments can be seen and indeed played in many fine collections both in the UK and abroad. The Benton Fletcher Collection at Fenton House in Hampstead, the Cobbe Collection at Hatchlands Park in Surrey, the Bate Collection in Oxford, and the Russell Collection in Edinburgh are just some of the places in the UK with superb examples of all types of harpsichords (and pianos), and are well worth a visit. If any readers are interested in having a trial lesson with Katharine, please get in touch! All ages and standards are welcome. Images: both harpsichords featured here were built by Michael Johnson (www.michaeljohnsonharpsichords.com) and are based on a 1637 Andreas Ruckers instrument which is in the Germanisches Nationalmuseum in Nuremberg.